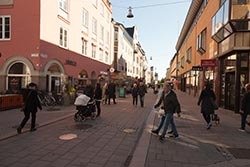 Uppsala is one of Sweden’s oldest cities. It was known as Ostra Aros up until the 13th century, when the name Uppsala took over. Today, Uppsala is one of Sweden’s four major cities and is world renowned for its universities, its magnificent cathedral and the legacy of Carl Linnaeus, among other things. Uppsala indeed has a long history. In order to explain the history of the city, we need to begin roughly 5 km to the north. This was the site of Uppsala 1,500 years ago, the power centre of the land of the Swedes and an important place of worship. You could sail there via the river Fyris, or the river Sala as it was known in those days. It was an important centre for trade and where the general assembly met and created laws and effected administration of justice. We took a regional train from the central station to Uppsala. It was a 40-minute journey. It's good to know that when travelling to Uppsala and back, be careful to hop only on the regional trains. Though other long-distance trains go via Uppsala, you are not allowed to board those unless you have a proper ticket. Fines are steep. Thankfully, we were warned by the ticket vendor, else we would have made the mistake. Our first stop was Gamla Uppsala. About 5 kms from town, we thought it prudent to take a taxi. Gamla Uppsala means old Uppsala. The known history of this very special place stretches back some 2,000 years. 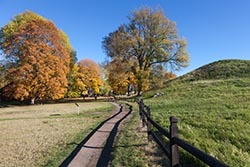 At Gamla Uppsala you can wander among the royal mounds, ruins and burial sites for a fascinating insight into how ancient Swedes lived, died and what they believed in. The nuggets of knowledge you’ll learn about at the Gamla Uppsala Museum include the mythical Svea kings, Norse gods and human sacrifices. Here, you can see the ruins of Uppsala’s first cathedral, dating back to the 12th century. At Gamla Uppsala Museum you can learn about the magnificent golden temple that is said to have stood on this spot and view the archaeological finds made here. A visit to the Disagarden open-air museum just behind the Gamla Uppsala church for a look at rural life in Sweden in the mid-19th century. At the beginning of the 12th century, Sweden was Christianized. In 1164, what was then Uppsala was made an archbishopric, and also became the religious centre of Sweden for around 100 years. In the mid-13th century, the city’s cathedral was almost destroyed in a fire. This, and the fact that the land elevation made the river Fyris practically impossible to navigate so far north, resulted in the archbishopric being transferred to the community of Ostra Aros, 5 km to the south. In 1286, the new Uppsala was founded. Uppsala became Gamla Uppsala (Old Uppsala) and Ostra Aros became Uppsala. A new cathedral was built and inaugurated in 1435. It was a pleasant Sunday morning. Sun was out, and so were the locals. 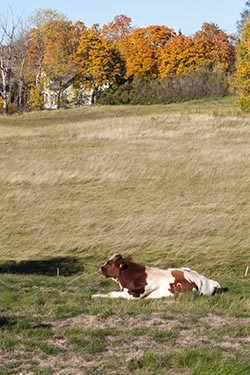 The meadows of Gamla Uppsala are a favourite spot for walkers. Autumn colours were at its full glory. After walking around for an hour or so, we took a bus to the city centre. Mind you, the buses don't accept cash. Only cards. The new Uppsala similarly became an important trading centre, but also a city of learning, when the first university in Scandinavia, Uppsala University, was founded in 1477. World-renowned scientists such as Carl Linnaeus, Anders Celsius and Olof Rudbeck the elder and many others carried out their work here. Our next stop would be the cathedral. The bus driver was kind enough to let us get down at a convenient stop, not far from the cathedral. Uppsala Cathedral (Uppsala domkyrka) is the largest and tallest cathedral in the Nordic countries. Construction on the cathedral began around 1270, with consecration taking place in 1435. The church towers were added later in the 15th century. The exterior of the medieval cathedral is unknown. The building has undergone several major restorations. Also, the fact that the church of Sweden became Evangelical Lutheran in the 1500s has had an impact on the appearance of the cathedral. 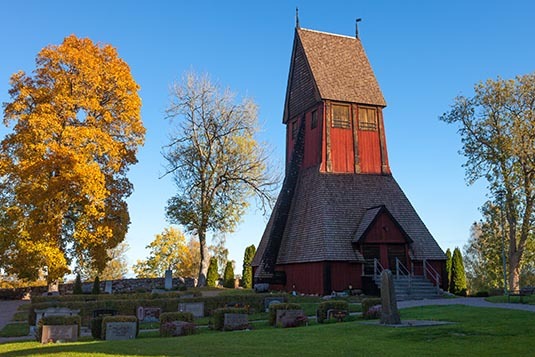 Uppsala is the seat of the Church of Sweden’s archbishop since 1164 and the place where bishops of other dioceses are consecrated and priest and deacons of Uppsala diocese are being ordained. Until 1719 many coronations took place in the cathedral. The cathedral is used for services every day all year round. Several important persons have been buried in Uppsala Cathedral, among them King Gustav Vasa (Gustav I) and King Johan III (John III) of the 16th century and their queens. Other examples are botanist Carl Linnaeus and his wife Sara Lisa Moraea, scientist and mystic Emanuel Swedenborg and Nobel Peace Prize winner Archbishop Nathan Soderblom. 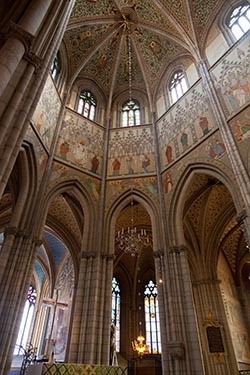 The cathedral's attractions include the reliquary of Saint Erik (Sweden’s patron saint), a medieval Saint Anne altarpiece and the 18th century Baroque pulpit. Mary (The Return) by Anders Widoff, the candle trees by Olof Hellstrom and wooden sculpture tableaux by Eva Spangberg are appreciated examples of modern art in the cathedral. The Treasury (Skattkammaren) is situated in the cathedral's north tower and houses one of Europe's finest collections of medieval church fabrics. Some profane textiles are also on display: Queen Margaret's golden dress is the world's only preserved evening gown from the Middle Ages and the garments are the only complete men's fashion wear that survives from the Renaissance. From the cathedral we began our walk towards the famous botanic gardens. We walked along the river, and then uphill. Quite a walk, but worth every foot. 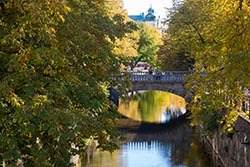 The Uppsala University Botanical Garden stylishly houses more than 7,500 plant species and is part of the Linnaean Gardens, with the Linnaeus Garden and Linnaeus Hammaby. 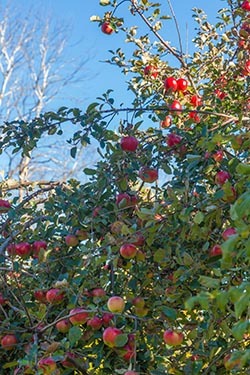 What you can expect and get here is a botanical and gardening experience par excellence. Visit the baroque garden and the park during spring, summer and autumn for brilliantly coloured summer flowers, charming alpine plants, trees and shrubs from all around the world. Make a pit-stop at charming summertime Café Victoria for coffee and buns before heading for the gorgeous 200-year-old Orangery (Orangeriet) for cacti, Linnaeus’ bay trees, as well as fig and olive trees. End on a sweaty note by taking in Uppsala’s only rain forest at the Tropical Greenhouse and see the coffee bushes, banana plants and orchids. Overlooking the botanic gardens is the Uppsala Castle. 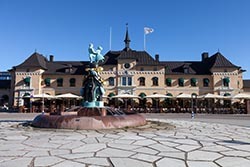 The building commenced in 1549 during the reign of Swedish King Gustav Vasa who intended it as a fortress. 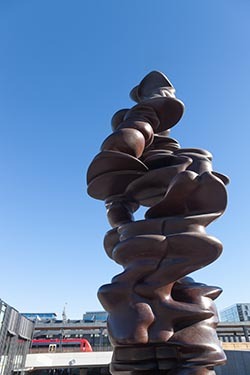 Look up from almost any location in Uppsala and you’ll see it on the skyline at Kasasen. As were fires, which engulfed Uppsala and the castle in 1702 when it virtually burned to the ground. Its remnants were then scavenged for the building of the Royal Palace in Stockholm, which didn’t help matters much. The castle facade you see today is faithful to the bright colour it was following its reconstruction in 1740. The castle now houses three museums, all of them well worth a visit – Uppsala konstmuseum (Uppsala Art Museum), Fredens Hus (House of Peace) and Vasaborgen. From the castle, we walked the main street, window shopping. Back at the station, we helped ourselves to a hot chocolate and took the next train back to Stockholm. The next day, we would visit Voxholm.